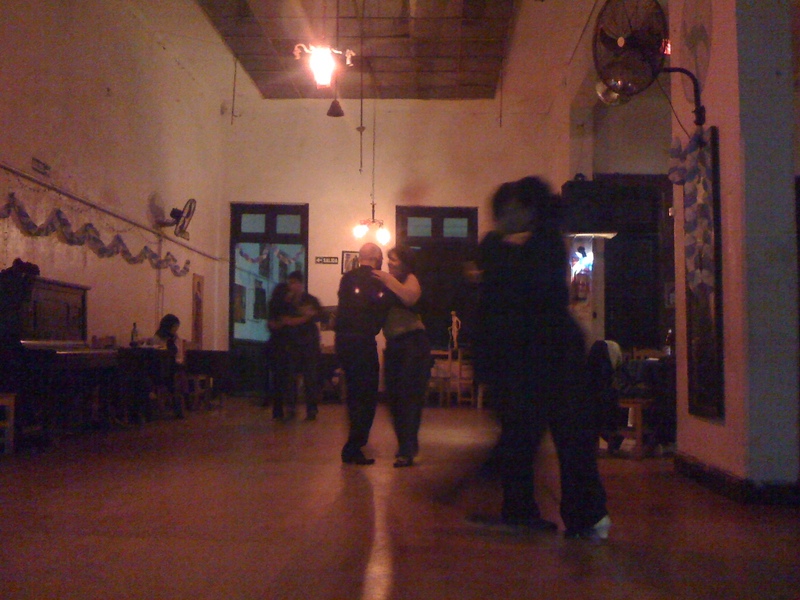 After some digging, I found out a door two blocks away I had walked by a dozen times on Avenida Independencia actually led to a milonga (Tango dance hall) called Flor de Milonga. The place was dark and empty with old Tango music blaring from two speakers. I showed up well after the band was supposed to start playing, but there was none, as not enough people had shown up tonight (Tuesday). There were a few couples dancing all the same, so I sat down for a glass of wine. It was great — I don’t dance Tango yet, so I just watched as couples showed their stuff. I met Juan Xavier from Columbia. He runs a Tango school in Bogota, and came to BA for three months just to improve his Tango dancing. Because it was slow he would dance with Rosa, the waitress of the place who claimed she was more into reggaeton and such, but could dance Tango if a man led her well. She looked beautiful, and together they seemed like professionals for all I could tell. I guess any self-respecting porteña knows how to Tango.